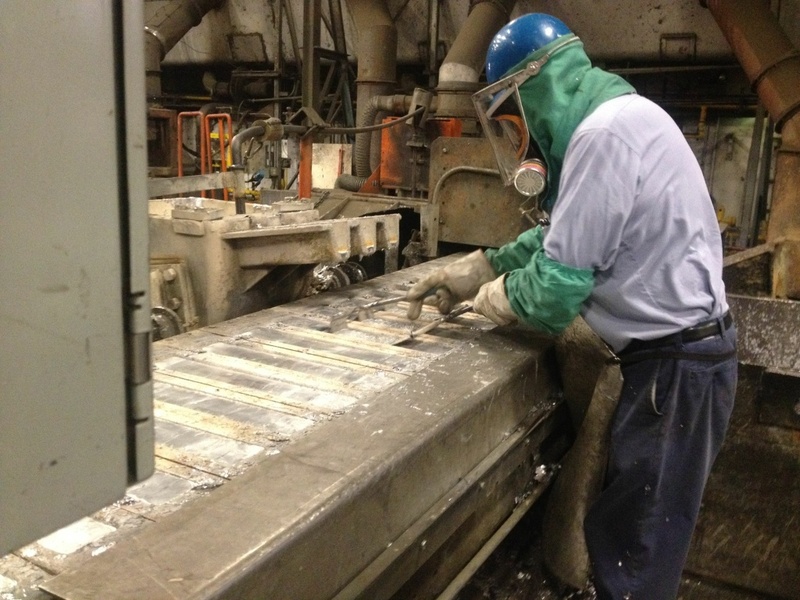 Quemetco, Inc. in the City of Industry recycles 600 tons of lead from batteries each day. The battery recycler is pictured here on Wednesday, Nov. 18, 2015. In the wake of a growing lead pollution investigation in neighborhoods around the now shuttered Exide Technologies plant in Vernon, state toxics regulators have ordered a second lead battery recycler in nearby Industry to test soil outside its property for lead contamination. 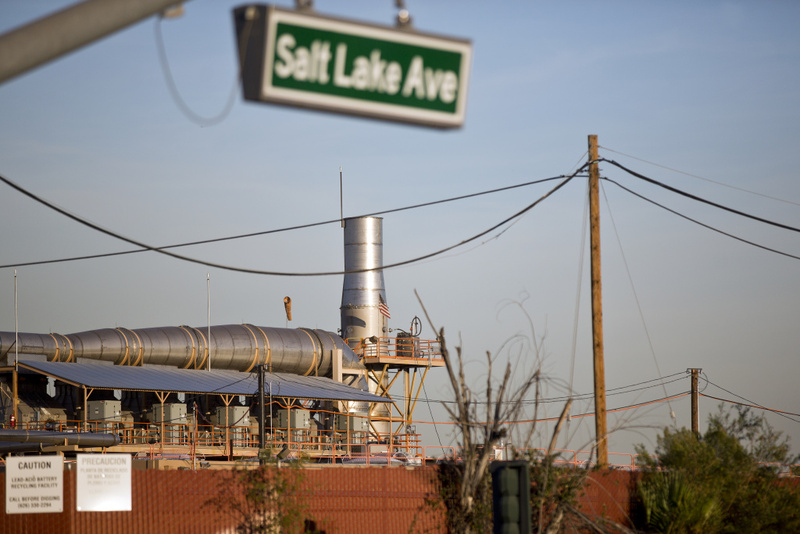 The state Department of Toxic Substances Control has given Quemetco, Inc. until the end of the month to submit a schedule for testing, beginning with a half-mile radius around the facility at 720 S. Seventh St. Each day, the plant processes up to 1.2 million pounds of scrap and lead. As with Exide, testing may eventually stretch up to a mile away from the plant if initial findings indicate the possibility of wider spread contamination. Dot Lofstrom, a division chief overseeing cleanup programs at DTSC, said the soil testing around Quemetco comes in part because of growing pollution concerns around Exide. In August, her agency announced lead dust from the Exide may have fouled as many 10,000 homes. The testing around Quemetco also comes as the facility works though the process of applying to renew its permit to handle hazardous waste, a decision that rests with the DTSC. Separately, Quemetco is seeking permission from the South Coast Air Quality Management District to boost the amount of batteries it recycles by 25 percent. Both agencies say the Quemetco plant has a cleaner track record than Exide. But the prospect of new soil tests raises concerns that legacy pollution from the facilityâ€™s more than 50 years of operations may require an expensive cleanup similar to the one underway around Exide. Already $16 million has been set aside to remove lead contamination from more than two hundreds properties around Exide. But that cost could balloon into the hundreds of millions if itâ€™s determined thousands more homes need cleanup. DTSC officials say preliminary results on soil samples near Exide show the facility is the source of contamination fouling the properties tested. Technicians found traces of the chemical element antimony, which suggests the lead came from the type of smelting process used to recycle batteries. DSTC plans to test for antimony in the soil samples taken around Quemetco. â€œWe have agreed to pay forÂ soil sampling and expect to take samples from up toÂ a one mile radius around the facility. Â We don’t want to prejudge the results of that sampling, but it will be public once complete. The newly announced testing isnâ€™t the first time investigators have looked for lead contamination outside Quemetcoâ€™s gates. In fact, the state of California has known about elevated levels of lead in soil at dozens of properties near the plant for 24 years. In 1991, the DTSC tested for lead in soil at more than 50 locations in La Puente, Bassett, Hacienda Heights and Industry. But until the newly announced testing, the department hadnâ€™t ordered any follow-up actions, Lofstrom said. She said the agency canâ€™t offer an explanation why further action wasnâ€™t taken immediately after the 1991 soil testing. â€œYou go back further in time, itâ€™s more difficult to piece together what really happened, what people were thinking,â€ Lofstrom said. DTSC did send letters to the properties tested. One dated July 29, 1992, tells a homeowner on Walbrook Drive, â€œThe level of lead in the soil collected from your property was 660 ppm [parts per million].â€ It is signed by the Department of Toxic Substances Control. Another home sampled showed lead contamination at 770 ppm. Lead does occur naturally in soils, ranging anywhere from 50 to 400 ppm, according to the U.S. Environmental Protection Agency. 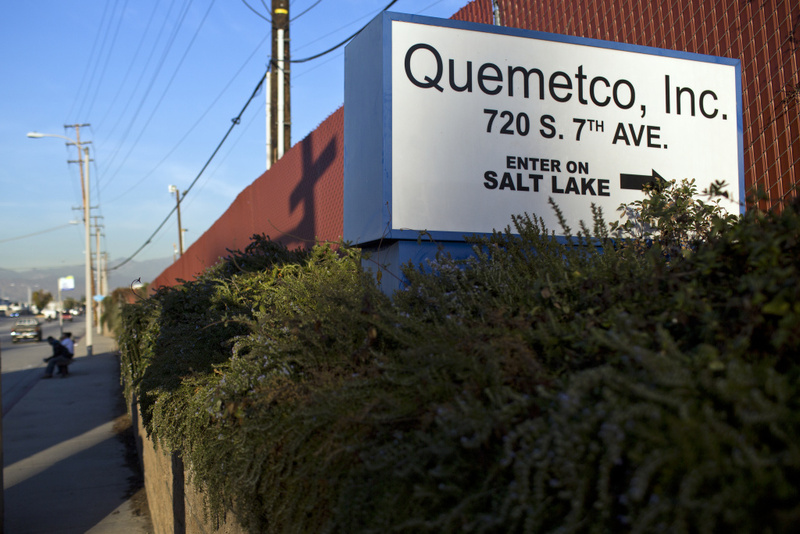 Experts in lead pollution say the contamination detected at properties outside Quemetco in 1991 is likely still there. According to federal health officials, there are no known safe levels of lead. People who breathe in airborne particles of lead or accidentally put it in their mouths â€“ especially children â€“ can suffer nerve disorders and developmental problems. Leed recyclers like Exide and Quemetco have been an important component in efforts to keep lead from polluting landfills. Nearly all the lead used in car batteries today has been recycled. A tour of Quemetco showed old batteries crawling up a conveyor belt headed for something called â€œthe hammer millâ€ where they were pounded apart. The crushed batteries then went to a water bath where floating pieces of the plastic shell were skimmed off. The rest went to a furnace where molten lead was removed. In 2008, Quemetco installed equipment to reduce the amount of airborne lead created during this process, according to South Coast Air Quality Management District. Itâ€™s a scrubber called a wet electrostatic precipitator. With it, lead emissions have plummeted. In 2013, the amount of airborne lead was two percent of what it was, on average, for the five years before the scrubber was installed, according to data from EPA. Quemetco remains one of the largest producers of toxic materials in the California, according to EPAâ€™s most recent Toxics Release Inventory. Quemetco reports almost all of that is slag leftover from the smelting process. That slag, mostly lead, is sent to a hazardous waste facility for disposal. Â According to EPA data complied since 2009, Quemetco has captured and removed nearly all toxins generated during the smelting process. Out of more than 8.8 million pounds produced, only a small fraction â€“ about 215 pounds â€“ was reported to have escaped into the air and water. Air regulators are concerned not just about lead, but also about cancer-causing chemicals like arsenic, benzene and hexavalent chromium. In the past two years, the AQMD reported five violations at Quemetco. One related to arsenic, the rest related to benzene. High levels of these chemicals have raised the cancer risk for people around the plant for some time, according to health hazard assessments prepared by the company under AQMDâ€™s direction. In 2006, Quemetco had the highest calculated cancer burden of any facility in the South Coast air basin, AQMD reported. Two years ago, AQMD asked Quemetco to prepare a health hazard assessment because of elevated levels of arsenic and other chemicals. Once completed, itâ€™ll be part of the record used to decide whether Quemetco can put more batteries into its furnace each day. California regulators have given Quemetco until the end of November to set a testing schedule around the Industry plant. The larger testing area includes the Avocado Heights community, a mix of dusty equestrian trails and suburban cul-de-sacs. Cindy Simonton grew up here. She still knows everyone on her block. â€œWhen my parents moved here, there was literally nothing but cows and crickets,â€ Simonton said. Simonton knew there was a factory nearby. She just never thought about it. Even a few months ago, she was reading about Exide in the news, feeling bad for people with health problems and tainted properties. Now the same issue is possibly at her doorstep. Correction: A previous version of this story said Quemetco was considered among the top polluters in the state, according to the U.S. Environmental Protection Agency’s most recent Toxics Release Inventory. That report indicates Quemetco is one of the biggest producers of toxic materials in California.